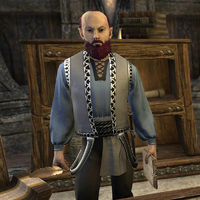 Canthion is a Bosmer housing broker who can be found inside the bank of either Daggerfall, Davon's Watch, Vulkhel Guard or Vivec City . He will offer to give you some property if you help him with a personal matter. Talking to him, he'll say, "If you're here about the property, you'll need to return later. I'm dealing with some... unforeseen complications." "Until recently, Bulag Idolus was my tenant. When I learned she used my property to run a skooma operation, she broke into my office and absconded with the deed! Without it, the Guard does nothing. They don't believe I own the place! It's a total loss." "I... yes, you can. I can't have the place tarnishing my good name. If you recover the deed and key, I'll sign it over to you. Bulag Idolus had a falling out with her old partner - Szugogroth, I think? Try finding him wherever scum accumulates in town." I'll find Szugogroth in the nearest Outlaws Refuge. "Thank you for helping me handle this... unusual issue. I assure you, I thought Bulag Idolus was entirely upstanding. She fled the Imperial City before the troubles. Though I always assumed it was because of the Daedra. Hmm..."
This page was last modified on 4 April 2018, at 05:29.